Quinlans Organic Salmon was awarded Gold Medals at the Great taste awards in London and we are proud that we get our organic salmon from a local supplier on the Iveragh Peninsula. Our Organic Salmon are reared in very deep water several kilometres from the Irish coast. 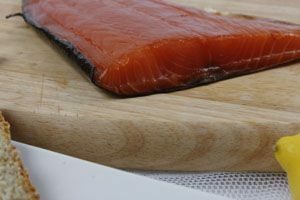 Our organic salmon comes from one of the world’s most exposed fish farms and the site is swept by strong tidal currents and high waves, the water quality is rated 1A – the best there is. These exceptional water conditions are pivotal to the success of our organic salmon. The Salmon swimming in the strong currents make the muscle texture firm and the fat content is very low. At the end of their life, the salmon will have swum the equivalent of 20,000 km which is about the same distance that wild salmon would cover. Organically farmed salmon are reared in large cages which allow them to follow their natural shoaling behaviour, and we have chosen this farm because the salmon density in the cages is very low and the conditions under which the salmon is farmed are very close to its wild counterparts. The salmon is raised from egg to grown fish in a traceable way. After 12 months in fresh water, the salmon are transferred to the cages in the sea where they stay for the next 2 years. On average, it takes 3 years to rear the salmon before it reaches you. When they reach 4.5 to 5.5 kg, the ideal harvest size, they are transferred by boat to our processing plant. The organic salmon farms are certified organic which means they have undergone a strict, high-standard certification process. Our organic salmon is fully traceable and certified by different organisations like The Irish Organic Farmers and Growers Association (IOFGA), Naturland (Germany), Qualité France, and Bio Suisse (Switzerland). They are also regularly audited by relevant government bodies like the Irish Department of Marine.